DUBLIN (AP) — The former chairman of Anglo Irish Bank Corp. was arrested Thursday on suspicion of committing fraud after he hid more than euro70 million ($100 million) in personal loans from shareholders. Police said they arrested Sean FitzPatrick, 61, at his home in affluent Greystones, south of Dublin, at sunrise and seized his financial records during a search. An arrest of FitzPatrick — one of Ireland’s most high-profile businessmen during the lost Celtic Tiger boom — had been expected ever since police raided the Anglo Irish headquarters in April 2009 shortly after the bank’s emergency nationalization to prevent its collapse. Government-appointed investigators have already found that FitzPatrick hid from shareholders the existence of his massive, mounting personal loans for eight years. Last week the new government-appointed leaders of Anglo filed a lawsuit against FitzPatrick seeking immediate repayment of euro70.4 million ($96.3 million) in loans. Most of those borrowings are secured only against the now-worthless stock of Anglo. FitzPatrick, who served as Anglo’s chief executive from 1986 to 2005 and thereafter as chairman, transferred tens of millions’ worth of loans each year into the accounts of another bank, Irish Nationwide, days before Anglo published its annual accounts to shareholders. The loans would be transferred back into Anglo’s private books immediately afterward. 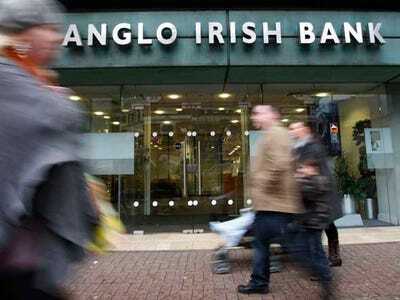 This accounting sleight of hand was detected when outside investigators began examining Anglo’s debt portfolios as part of an October 2008 government decision to insure all the deposits and debt obligations of Irish banks. FitzPatrick resigned in December 2008. FitzPatrick became the first member of Ireland’s so-called “golden circle” of elite businessmen to be arrested in the spectacular fallout from Ireland’s collapsed property market. Many in the circle were personal friends of FitzPatrick who benefited from ill-secured multi-million loans from Anglo, a specialist lender to Irish businesses, particularly developers and property speculators.